I have been a fan of Nasi Lemak RA ever since I tasted their yummy food at the last Fried Chillies Nasi Lemak Bash. It's pretty easy to get to this place which is just off Jalan Dang Wangi and you can drop by here before you head towards the office. In the mornings, there's a lot of people milling around the place to pack their nasi lemak to the office or to pick and choose which toppings they want. What amazes me is how you can get a mixture of motorcycles and luxury cars thronging this place to savour the nasi lemak. 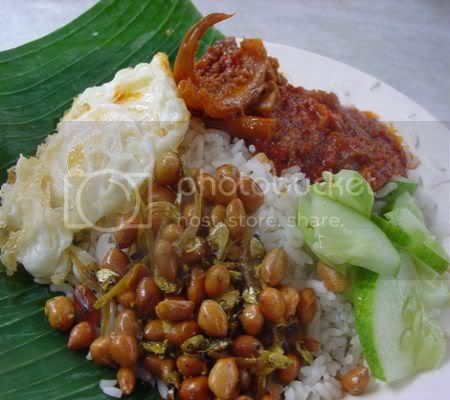 No wonder, nasi lemak can be considered as Malaysia's national food as everyone loves it. The nasi lemak here suits me fine as I am not a fan of fiery hot sambal which burns my tongue. The sambal is also not too sweet and has the right chilli balance for me. 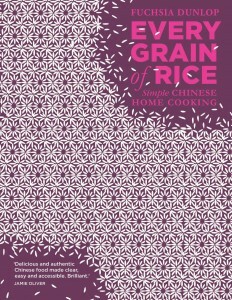 Most importantly the rice has a lovely coconut aroma and is al dente with the rice grains seperate. Choose from the curries available but my favourites are the sambal sotong (calamari) or their fried chicken. They are open in the mornings (Monday to Sunday) and evenings (Monday to Fridays). Recently, I have been really slack in participating in food events probably due to the themes which I was not too keen on. However, when I read this month's joint food event was hosted by Reid from 'Ono Kine Grindz and the theme was "The Joy of Soy", I knew I had to try and make this one even though this time round, I did take some shortcuts. I'm glad Reid is still taking in entries up to June 30th as I am one of those stragglers who can only submit now. He's already posted part one of the round-up if you want to start viewing the entries. On our side of the world, soy plays a huge part in our daily lives. You can get all sorts of soy variants everywhere you look - fresh soya milk and soya bean curd in hawker stalls, soya sauce in everything we cook, tofu in almost all our dishes, bean curd skin in tong sui ( soupy desserts) and etc. My savoury items for this event are teeny weeny tofu bites to whet your appetite. 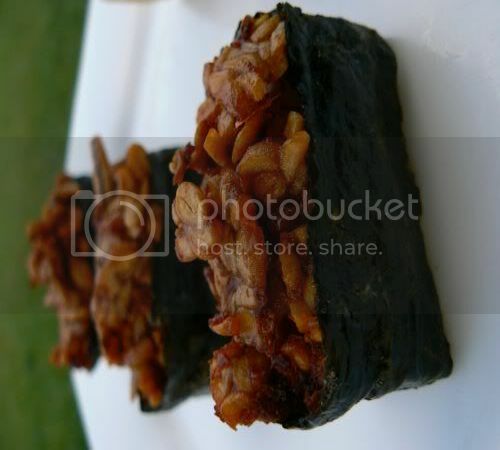 First, we start off with tempeh sushi that marries Malay and Japanese influences together. 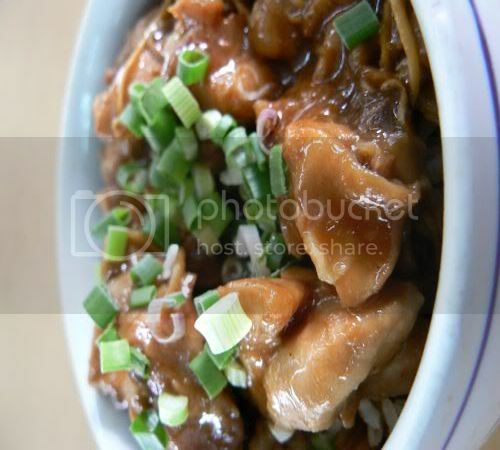 Tempeh is made from fermented soya beans which is sometimes used as a vegetarian subsitute for protein. 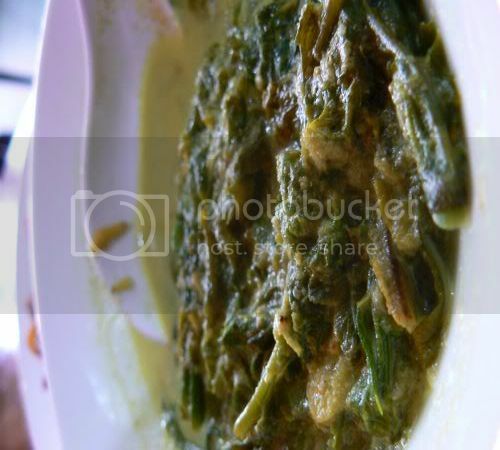 It's extremely popular in Malay and Indonesian cuisine. Some people tend to avoid the freshly made tempeh as it kinda stinks but don't be alarmed as once you cook it, the smell goes away. Tempeh is usually added into vegetarian curries or coated in batter and deep fried as a teatime snack. My favourite way of eating it is deep fried with anchovies (ikan bilis) and peanuts coated in a sticky chili sauce. I confess for this item, I took a short cut - I didn't make the tempeh myself but assembled the sushi instead. Sorry for that but since it was mid week when I made this, I was running out of time to make it from scratch. If you wish to recreate the tempeh, email me for the recipe which I have. In making the sushi base, I also had some problems as I originally wanted to make it with a cucumber wrapping but since I had bought the wrong cucumbers in my haste, I had to settle with not so crispy seaweed for the wrapping. Taste wise, was it good? Yeah, it was very good as the tempeh topping was nice and crispy that went well with the sushi rice. Would have been much better if my seaweed was crispier. 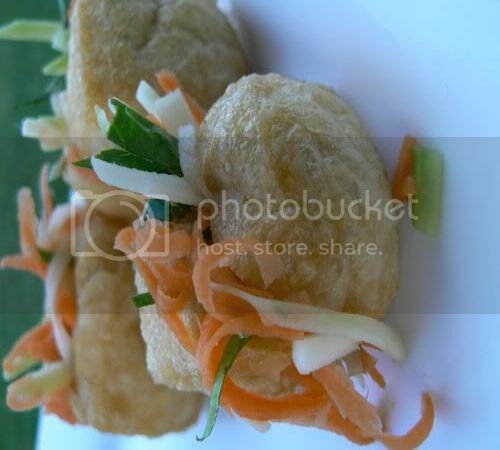 My second teeny weeny tofu offering are green mango salad stuffed tofu puffs. Stuffed tofu (tahu sumbat in Malay) is a popular snack where it's usually stuffed with bean sprouts, shredded cucumber and shredded yam bean. 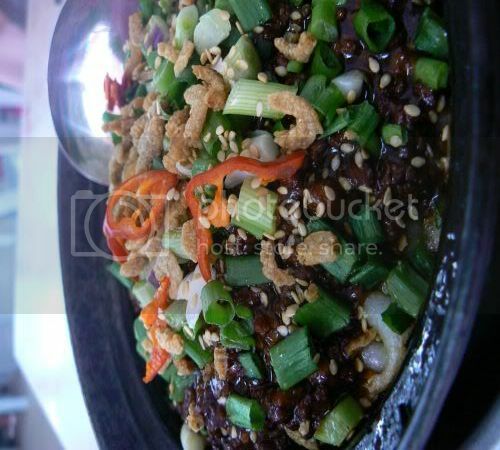 It's then served with a black rojak sauce made from prawn paste or chilli sauce. My version uses green mango salad instead which I had tossed in a mixture of fish sauce, lemon juice and sugar to give it the sweet, salty and sour taste. It's quite simple to assemble as you need to shred the green mango and carrots. I also added shredded kaffir lime leaves for additional fragrance. Toss the salad in the sauce taking care to drain it a bit when you stuff it inside your tofu puffs. Down these healthy tofu snacks with chilli sauce for additional spice. Finally we have dessert as it wouldn't be a Sugar High Friday event without something sweet. I didn't want a soy milk dessert so I decided to hit my recipe books for inspiration. After flicking through a few - soya milk curd, soya milk pannacota and etc, I finally settled on this unusual dessert i.e. 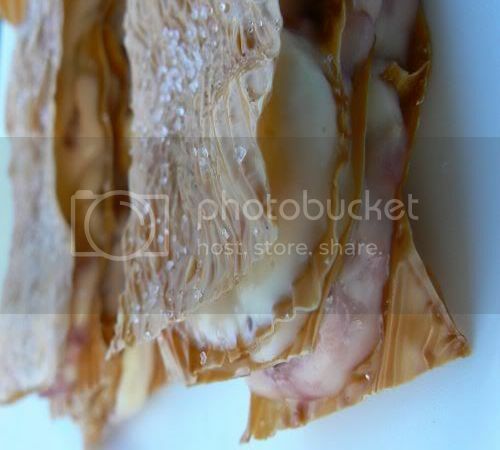 the soya milk skin and strawberry millefeuille from Shunju:New Japanese Cuisine. I was amazed with this dessert as it tasted great and was definitely my favourite among all my soy entries. It's extremely simple to make too. Although the recipe uses fresh soya milk skins (better known as yuba or fu chuk in Chinese), I used the dry version as the wet version is difficult to get. I got mine from an organic shop as it's less oily. I followed the recipe to crisp my soyamilk skins and they browned in the oven. For my cream, I did not whip it since I had bought heavy cream which did not need whipping but mixed in the yummy strawberry preserve. Incidentally the strawberry preserve is a great idea as you can use it for not so sweet strawberries. It's advisable you assemble the dessert as soon as your soyamilk skins are crisped and don't load too much cream on each layer or your millefeuille will be soggy. Preheat the oven to 180C. Place yuba on a cookie sheet and sprinkle with sugar and bake for about three minutes. They should be brown and crispy. Put 18 of the strawberries, water and sugar in a pan. Simmer for about 30 minutes until you have a preserve. Cool and reserve. Whip the cream until it starts to form peaks. Mix in the cooled strawberry preserve. Spread one sheet of yuba with strawberry cream, then repeat till you have 4 layers of yuba per serving. Garnish with remaining strawberries. I'm still exploring Pudu as the place is huge and peppered with so many food stalls. This part is off Jalan Pudu at the turn off where the Caltex petrol station is and pretty near the wantan noodles. 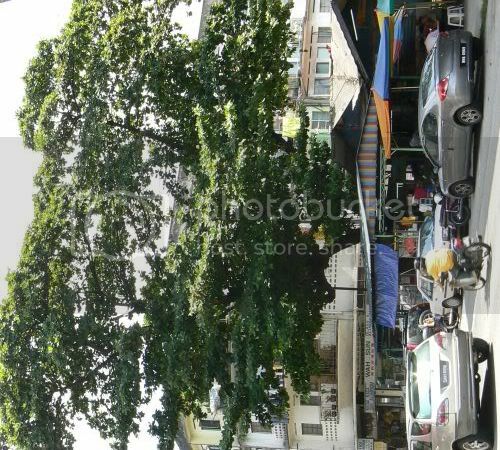 Underneath this huge tree, there are three stalls which serve curry laksa, chicken with noodle soup, beef noodles and kampung chicken rice. There is also a drinks stall which serves the patrons of the three stalls. I ordered a small beef noodles (RM4) - dry style as I liked the look of the noodles. 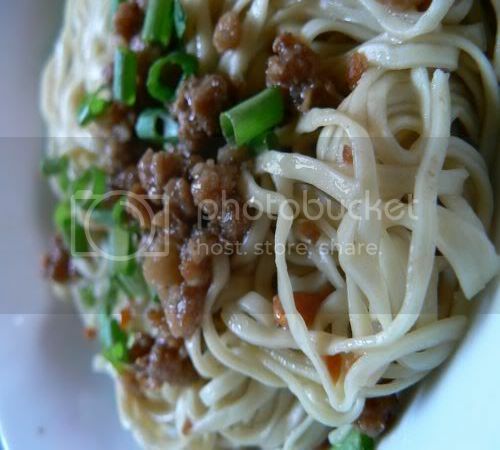 I love the noodles that came tossed with a little minced meat and fried garlic on top. Very crunchy and so nice especially when you add a bit of soup to loosen up the noodles. The beef soup which accompanies the noodles had an assortment of beef balls, tripe, beef slices and preserved vegetables (ham choy in Chinese). The soup is unlike the other beef noodle places which is usually clear colour but this was pretty tasty too. The other stall serves curry laksa and chicken with noodle soup. 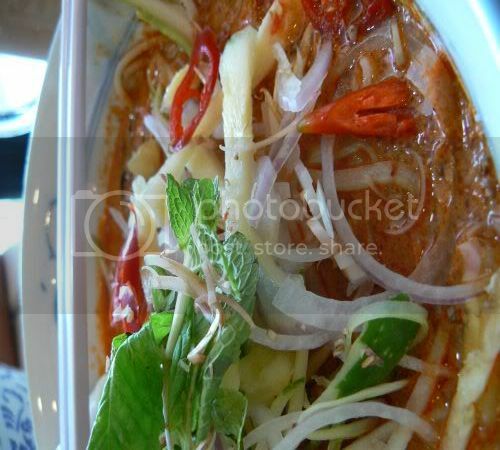 We tried the curry laksa which everyone was eating and it was pretty good. The curry sauce is quite thick and not too spicy. For added spice, you can add their sambal. You have a choice between boneless shredded chicken or chopped chicken which the stall owner will chop for you on the spot. The two ladies who run this stall seem to be having a whale of a time and once when things were not too busy, I even caught one of them singing away. Another must have at the stall which I observed everyone having is their chicken feet curry. This wasn't my favourite as I prefer the Indian kind as they cut up the feet in smaller parts and somehow theirs is more tender. 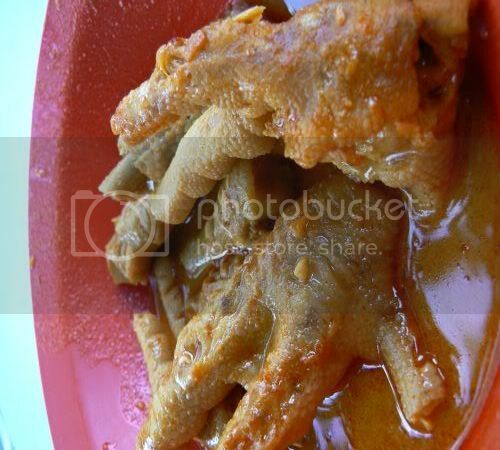 The chicken feet was also difficult to eat and quite fat. Besides these two stalls, there is also a chicken rice stall which we did not try out. I'm sure most of you have heard about this restaurant which serves Balinese food in Puchong as I have seen so many blog entries about it. I can't claim to be an expert on Balinese food since it's one of the places I have never been so whatever little knowledge I have is garnered from my reading. Although this restaurant bears the same name as the famous Bumbu Bali located in Bali, it has no connections whatsover to the original place. The original Bumbu Bali is famous for it's cooking school and if you go to any bookshop in KL, you'll be able to see the recipes from the book, The Food of Bali. 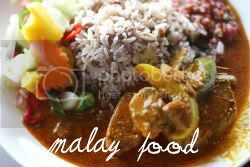 The restaurant in Puchong has a very extensive menu which offers Balinese food and Western meals with a Balinese twist to them. My only complaint about the menu is I thought it didn't have enough Balinese food items and the emphasis was more on Western items. After a while, everything is the menu tends to taste the same as they predominantly use the same kind of marinade for the meat, poultry and seafood which is barbequed over a coconut husk fire. We tried to pick the more genuine Balinese food items hence I ordered the Nasi Ayam Betutu (RM19.50++). My chicken was roasted with numerous spices such as turmeric, ginger, galangal, onion, garlic, kencur salam leaf and chillies. Traditionally it's served at wedding ceremonies. I liked the chicken which was full of flavours. Only problem was my portion of chicken versus the rice served was disproportionate hence after a while, everything was too salty for me when I ran out of rice. To get a taste of all their specialities, Splashie Boy had their Nasi Campur Special(RM28.50++) which came with Sate Lilit, Grilled Chicken, Grilled Prawns, Grilled Fish and Grilled Cuttlefish. You have a choice between two types of rice, the sweet potato rice and Nasi Kuning (Yellow Rice). I had the sweet potato rice which was nothing special as they had just mixed the cubed sweet potatoes in. We both liked the Sate Lilit which is minced seafood paste wrapped around lemongrass skewers. Theirs definitely look much better than my version. 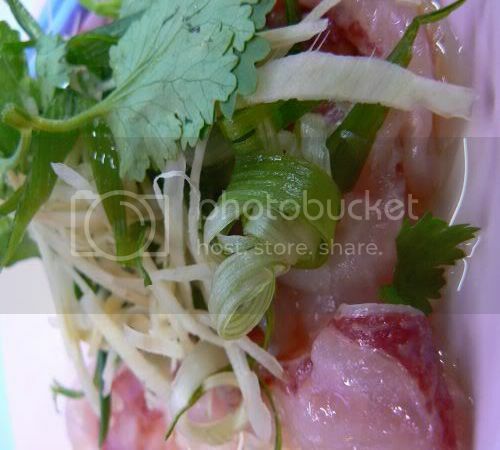 We thought the fish was very nice and tender while the prawns were not that fresh. I was introduced to this place by my mother whose friends brought her here one day. It's pretty easy to find this place which is just off Jalan Kuchai Lama. 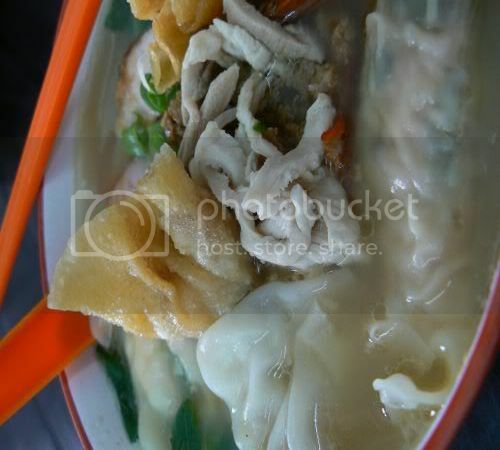 They are famous for their XO Fish Head Noodles which is a must order when you visit here. Unlike the other fish head noodles in town, this one is tangy as they add sour plum, preserved salted vegetables (Ham Choy in Chinese), sliced chillies and sliced tomatoes. They also add fried yam which is a must for Hokkien people. On the XO sauce, it seems it is a sauce they add in which gives the soup an extra oomph but you can't really see it. 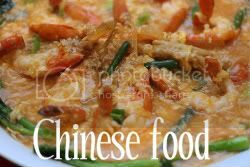 I really love their version as the tangy taste cuts through the richness of the dish which comes from the addition of evaporated milk to the soup. Mash the tomatoes in the soup and slurp it all up including the thickish noodles they serve it in. A small claypot (RM14) can probably feed two hungry individuals. 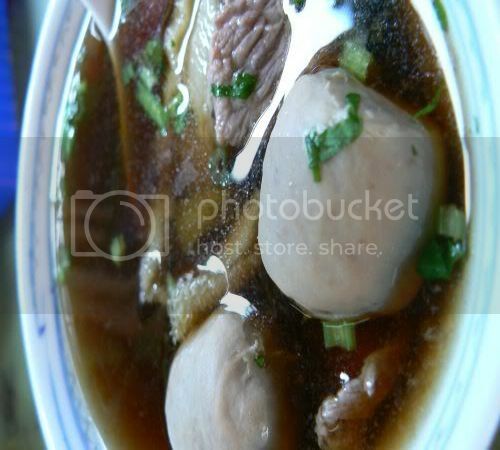 This place is also famous for their version of Claypot Loh Shue Fan (i.e. Rat Tails Noodles). Unlike the extremely notorius dish found at Seng Kee, Petaling Street or their branch, Mama's Kitchen in Taman Tun Dr Ismail, this version is less oily, the minced meat topping is drier and has lots of fried dried prawns. The Seng Kee version has minced meat, chopped liver and prawns which makes the topping have less bite to it. At Seng Kee, they add a raw egg on top of the minced meat topping to be mixed in while this place adds the egg in the claypot first before topping it with the noodles which cooks it thoroughly. 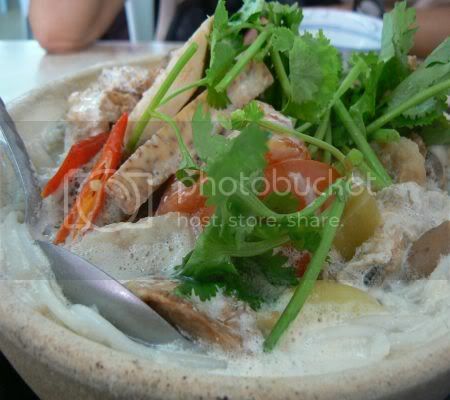 A small claypot (RM4) was ordered to test it's taste while the rest was packed back. Even after a few hours, the noodles still tasted great. 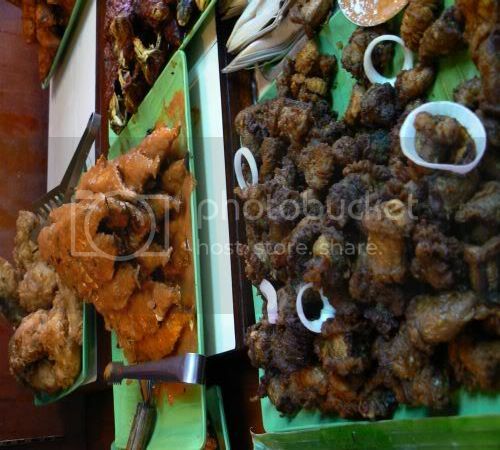 The restaurant is well known for catering to special functions and they have a pretty extensive menu. You can also get tong sui here i.e. fu chok yee mai. Other popular dishes are their Kow Yoke which looks like the Esquire Kitchen's Tong Po Yoke that is served with steamed buns, fried noodles and fried rice. (If you are coming from Old Klang Road, turn into Jalan Kuchai Lama. You'll pass a traffic light and a school known as Sri Setia Primary School on your left and on a bend. Once you round the bend, you will see Shell and Esso petrol stations on your right hand side, turn right after the two petrol stations. Go straight down the road and there will be a row of shophouses on the right hand side which is where the shop is. We had a pretty exciting week in the kitty world. For a few days, the grey and white fella decided to take a hike from home. Not sure why but maybe he overheard us saying we wanted to take him to the vet on Monday to do that "snip snip deed" which all male kitties dread. I went around the whole neighbourhood including all the back lanes calling him until the neighbours thought I was crazy. Thankfully he appeared on the doorstep one day looking tired and slightly bruised up. It was then straight to the vet for his session as we were worried his hormones had gotten the better of him - maybe a pretty girl cat walked past the house hence he went on a walk to convince her to be his mate. Ever since he came back, he has been quiet and extremely attached to me. I keep giving him hugs all the time to reassure him he is safe. Then, I found a stray kitten in the middle of a public road. A teeny weeny thing which looked extremely lost and would have been a flattened kitten if I did not rescue it. 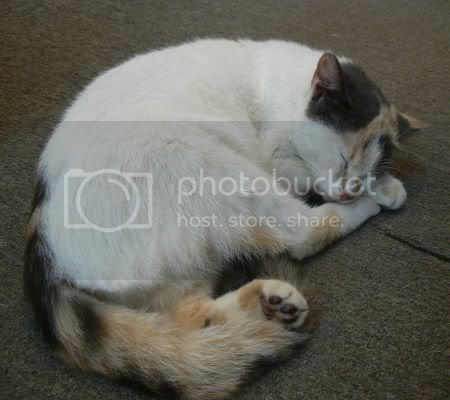 We sent it to the Taman Tun Dr Ismail pet shop where the little one is now residing, pending adoption. We tried to take nice pictures of it yesterday but it loves to wriggle and would not keep still at all so we have lots of wasted shots. Best one I could find was this one where I had to manhandle it to keep still. 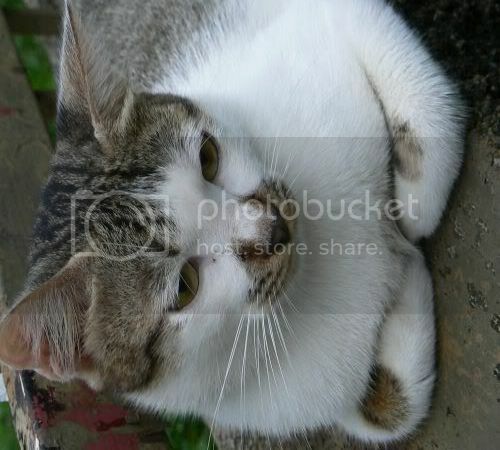 It looks like a Persian mix as it's extremely fluffy and has such a sweet pointy face. If you know of any friends who want a kitten, do drop by the pet shop and visit it or better still, take it home. It loves people to cuddle it. The pet shop address is below. Do head over to eat stuff for more kitty pictures this weekend. 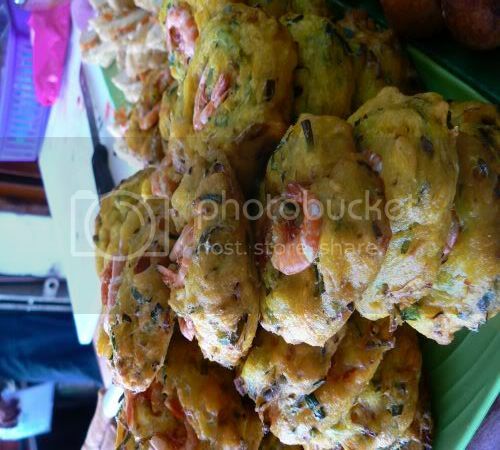 Last weekend when we were at 1 Utama Shopping Centre, we stumbled upon the Agricultural Fair. It was pretty good as they had lots of stalls selling local fruits from the government run farms. We bought rock melons which were nice and sweet. Besides the fruit stalls, there were also stalls selling local food i.e roti arab, cakes, snacks and etc. We were extremely attracted to the Bahulu Classiq stall as they had brought in an oven and was whipping up fresh bahulu that smelt great. For those who have never heard of Bahulu, it's made from a mixture of flour, eggs and sugar that is cooked in brass or iron moulds. You can get them in different shapes, the traditional flower or button shape and even goldfish shape. Texture wise, it's spongy on the inside with a slightly crunchy crust. Traditionally it was cooked under a kerosene fire but nowadays everyone bakes it in an oven. What was extremely unusual with this stall even though there were others selling the traditional Bahulu was their version with Pandan flavour and chocolate chips. 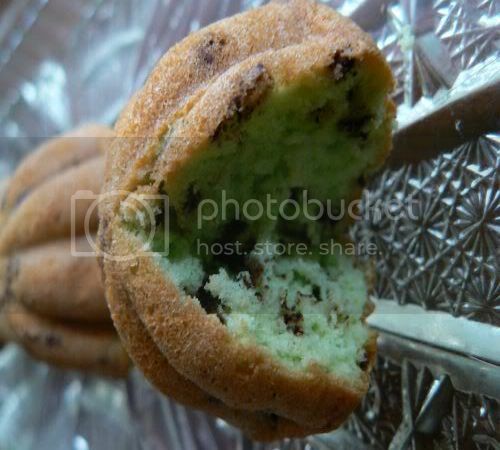 They had cut the bahulu to small pieces for people to try and it was really good hence we bought two boxes. There was a small assembly line at the stall with a mixer to make the bright green batter and a lady sitting at a counter spooning the batter into the moulds. The moulds will have a bit of oil in it that is dabbed with the pandan leaves brush. Not sure if you can see the guy behind with the glove but he is in charge of putting the trays in the oven and taking them out later. Once they are done, the bahulu is knocked out from their moulds and placed in a basket to cool down. If you eat them when they are hot and fresh, they taste fantastic. Leave them for a while and it's still yummy especially with a cup of coffee that you can dunk them in. Splashie Boy calls them Malaysian Madelines as they have a similar crusty exterior even though they don't have any butter inside them. The stall was doing brisk business and besides the Pandan flavoured bahulu, they also had a capuccino flavoured one and the plain ones. It seems their factory in Hulu Langat can churn out 30,000 bahulu a day which is for export purposes. I'm finally over my flu bug but it got me hankering for porridge for breakfast. 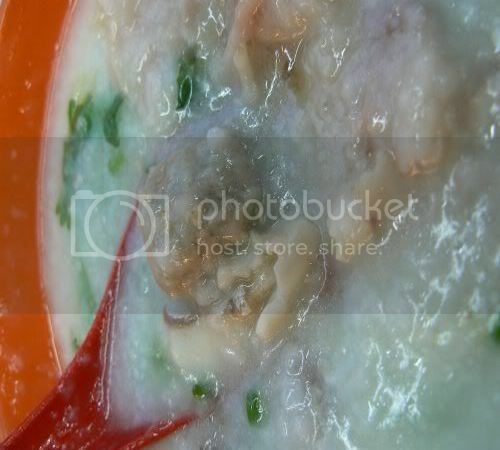 I'm partial to the porridge found in Cecil Street (or Jalan Hang Lekir as it's known now), Petaling Street which is my standard of great porridge since it's the place my parents took me since I was a kid. I love wandering around Petaling Street in the early morning as it's nice and quiet without the bustle of the stalls that sell their fake luxury goods. Sorry for the not too nice picture of my bowl of porridge. I had added everything in: i.e. 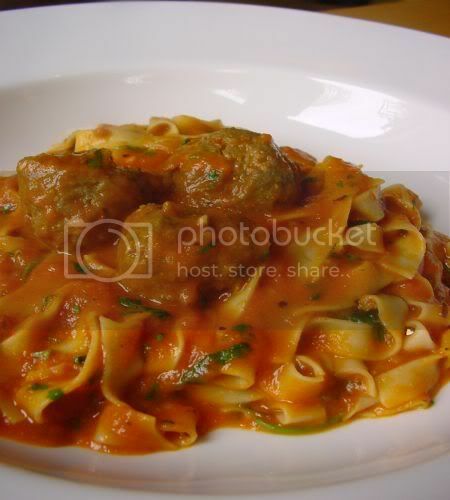 minced meat balls and the raw fish slices as seen below. Usually the porridge comes with only one item but it's been a tradition with my parents that we add an extra plate of raw fish slices in the hot bowl of porridge. The raw fish slices (Wan Yue in Chinese) is always served with a dash of sesame oil and lots of shredded ginger, spring onion and coriander. Just plonk it in your hot porridge and they'll cook themselves. Accompany this with a plate of sliced yau char kuai (Chinese crullers) and you'll be in heaven. I love the smooth texture of the porridge as they cook it on slow heat hence it's nice and smooth. Of course there will always be changes with time and nowadays when you have your breakfast, you can be entertained with live music. 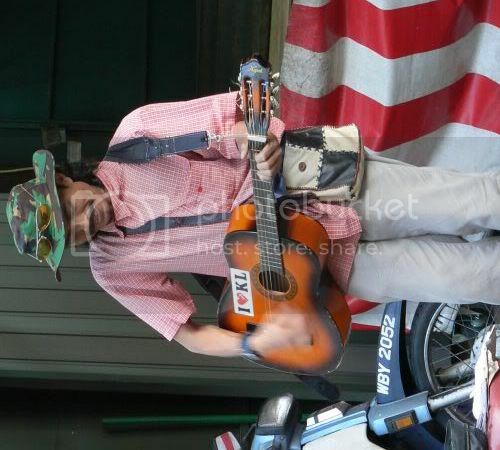 It was quite strange to see a busker early in the morning since they usually play at night but this fella was happily strumming out oldies like Rod Stewart's Sailing and even old Malay songs. If you're feeling very adventurous, take a walk after your breakfast. Turn right at the first alleyway after the porridge stall (where they are frying the yau char kwais) as you will see fresh wantan mee being made in a small factory. They don't really allow you inside the place but you can peek in but they sell the freshly made wantan mee, pan mee, yee meen outside. Walk further down and you'll see lots of foreign workers hanging around make shift stalls where they are said to peddle stolen goods. You'll see items like shoes which have been pinched from people's backyards, clothes, electrical items and all sorts of things. However, be warned that it's not exactly a very safe place so be cautious when you walk through there. If you walk the other side of the stall towards Malaya Hotel, you will find Madras Lane market inside the alleyways where you'll see all sorts of fresh produce and items especially those enormous fish heads sold to steamed fish head stalls. As I am totally unfamiliar with Pudu, I was not sure what to have for lunch when I was around the area. Following my instincts, I found this Wantan Mee stall at the corner of a walkway which looked like it was doing brisk business. Since it looked good, I decided to give it a try. 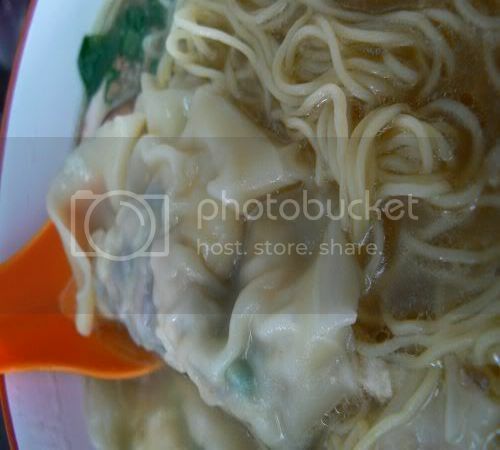 I ordered wantan mee with soup instead as everyone around me was going for the soupy version. Also added two Siu Kaw (large dumplings) and two fried wantan after observing my neighbours slurping down theirs. 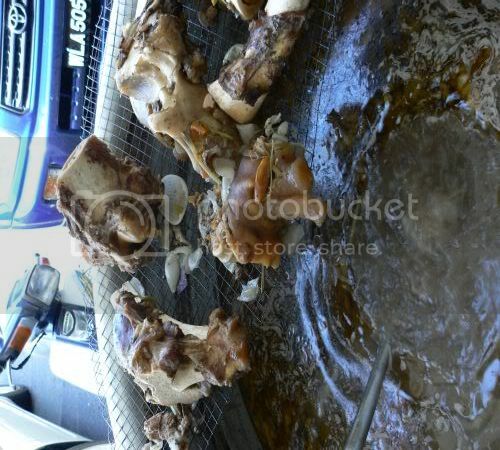 Each standard order comes with two wantans and a shredded chicken and minced meat topping. I liked the wantan mee which was a lovely texture but I thought the wantans were only okay. 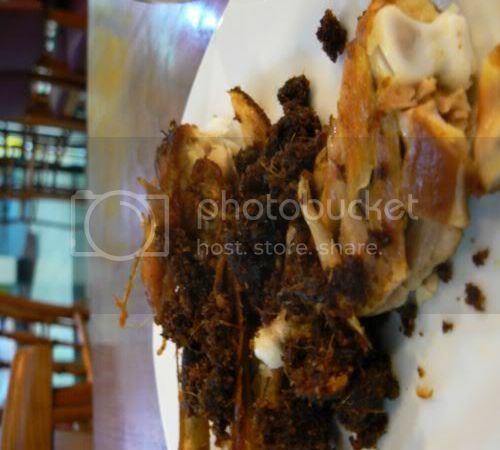 What blew me away was their siu kaw - full of minced meat, water chesnut, crunchy black fungus and prawns for RM0.70 each. Very yummy and definitely a new favourite for me. The ladies that run this extremely compact stall work at the walkway of the road while tables and chairs are placed around. There's also another area i.e. a shoplot slightly away from the stall that is located at the corner of the road. You find a place to sit and one of them will take your order. They also serve a refreshing cincau (grass jelly) drink. If you have any other food recommendations for the Pudu area, do drop me a comment as I would love to explore more places. I tried to get egg tarts from the nearby Tong Kee Confectionery but sadly they had sold out. The weather is driving me crazy - one minute it's super hot and then it starts to rain. Not good for me as I have caught a cold which does not seem to be going away. Since I have been craving for lots of liquids, I decided to have the steamed rice and soup one day. This corner coffee shop located behind the Giant supermarket in Kelana Jaya is always packed during lunchtime since it's full of varieties plus it's the only coffee shop around the area. One of the more famous stalls is this Ipoh Steamed Rice stall which has been featured in Flavours magazine and Chinese magazines. 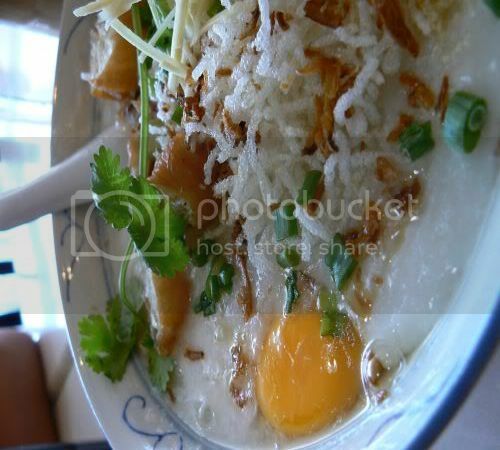 They serve a variety of steamed rice dishes whereby small metal plates with the ingredients are steamed seperately. Once ready, they are placed on top of the steamed rice. I like their steamed rice as it's nice and fluffy. There are different varieties of steamed rice to choose from i.e chicken with chinese sausage, chicken with salted fish, chicken with mushroom and etc but I had the chicken with ginger (RM4) that was full of flavour. 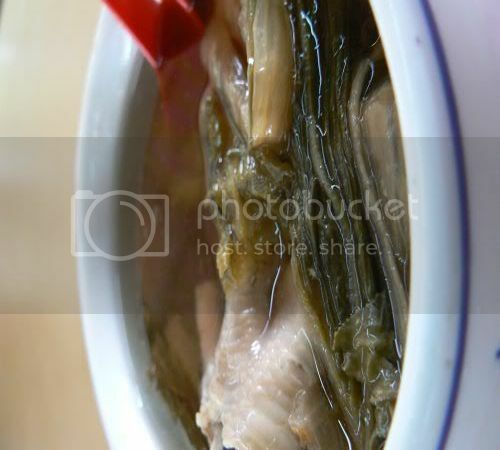 I also ordered the steamed soup with dried vegetables that is cooked with chicken legs. (RM3.50). They also have a few varieties of soups i.e. herbal soup, old cucumber soup, peanut soup for you to chose from. I like their soup as it's not as oily compared to the steamed soups you can also get at claypot rice outlets. Recently we had an excellent dinner at Chynna, KL Hilton for my mother's birthday. Sadly I could not snap any pictures since my family members would have been mortified if I whipped out my camera since they're regulars there. Despite all the kitschy kung fu costumes the wait staff have to wear, I must admit food here is very good. To celebrate, we had the Beijing Duck, Mongolian Beef, Prawns with Salted Egg, Honey Glazed Chicken with Ginger, Birthday Noodles, Stir Fried French Beans and Spinach in Soup and Wolfberries. We finished off sharing the Lime Sorbet, Lemongrass Jello with Aloe Vera. My favourites are definitely their Mongolian Beef that came in tender beef cubes and the chicken. 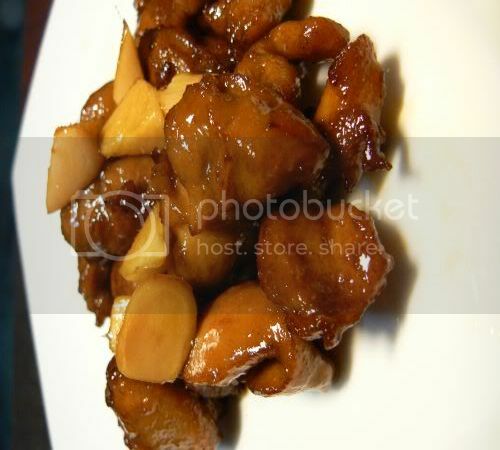 Since I could not take any pictures, I decided to make my version of honey glazed chicken with ginger. It's unlike the one at Chynna which is ten times better especially with the crispy waferlike ginger slices they serve it with. I tried making the deep fried ginger flakes but failed as they just could not stay crispy. Think I'll need to dust them with flour the next time. This version is actually from the bilingual Yum Yum magazine. For my version, I have deboned chicken legs and removed the skin to keep down the fat levels since it is deep fried. If you don't like deep frying, pan fry your deboned chicken instead. Although it's not the same, I would say this dish is excellent and simple to make. Hope you'll enjoy it as much as I did. Cut the young ginger into small cubes and add in the marinade. Mix well and leave for one hour. Combine chicken with soya sauce and corn flour. I usually leave it to marinate for 1 hour that I am waiting for the ginger. Deep fry in hot oil till golden brown. Drain excess oil on paper towels. Pour sauce into a pan, ginger pickles and cook on low heat until the sauce thickens. Add the fried chicken and mix thoroughly. Dish up and serve. 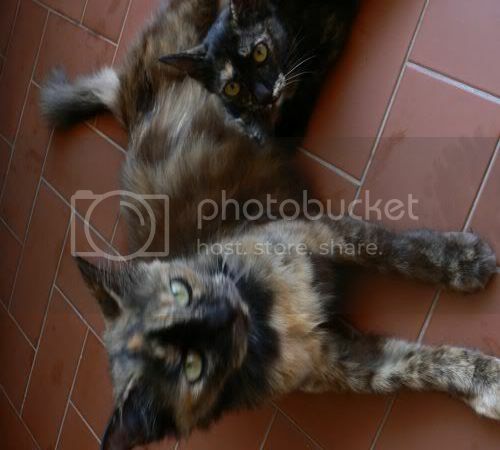 Do visit eat stuff for more kitty pictures including the resident cutie pie, Kiri. One day, I ended up at Jalan Alor, KL's famous red light district and hawker food centre for an extremely late lunch. Since it was so late, almost 3 pm when I walked down the street, most places were either closed or had not opened for the night session yet. The only place which was bustling with people was this shop that sold fish head mee hoon (Yue Tow Mai Fun in Cantonese), Curry Laksa and Seafood Tomyam Noodles. Hence I decided to give the noodles a try since I wanted something different. 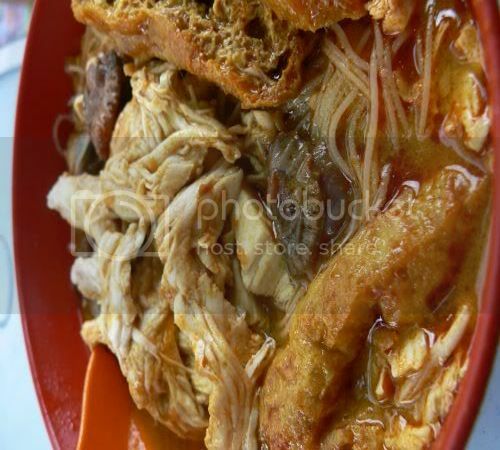 The fish head noodles(RM6) came with large chunks of deep fried fish head pieces dipped in a floury batter. I liked the fish which was fresh. However, it was full of bones so it was a slow process eating it. The soup base is made from fish stock or boiling the fish head pieces and has a dash of evaporated milk, ginger slices and sliced tomatoes. Overall, I thought the noodles was pretty decent but not fantastic for me to revisit the place. 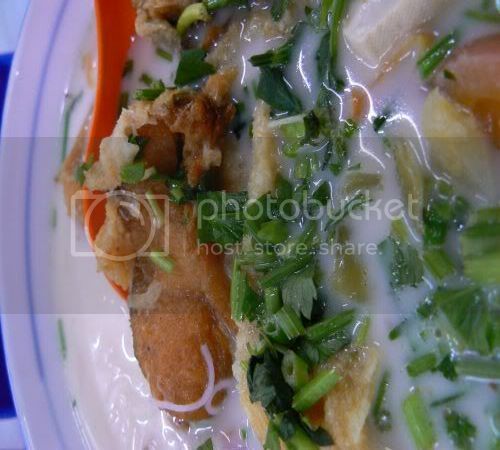 For me, the ultimate fish head noodles is still from Ka Soh. I'm currently in a Nasi Padang craze ever since I discovered how tasty the food is. Although I have yet to try the famous Minang Salero over in Sentul, I have been slowly exploring the ones that are located in Petaling Jaya. Incidentally, this started out as a review of two restaurants but then I discovered the Pusako Restaurant featured on Klue magazine's blog has been taken over Salero Negori. It's strange how good food kinda hits you straight in the eye - I have been to Sumatra and Jakarta before but somehow I was not impressed with the food then. Probably because I did my trip to Sumatra when I was still a teenager and my Jakarta trip was plagued with my friends getting food poisoning even though it was hotel food! Nasi Padang seems to be catching up here and there are franchises from Indonesia that are slowly popping up all over the place. With Salero Negori, their Nasi Padang is more localised as they serve a mix of Padang and Negeri Sembilan dishes. Negeri Sembilan is one of the states in Malaysia which majority of the Minangs stayed when they migrated from Sumatra. Like Nasi Campur, you choose from an array of dishes but instead of picking the portions yourself and adding it to your plate of rice, the wait staff will serve them in small little dishes. If you have lots of people eating together, you get to try a large variety of food which is great. Out of all the dishes I tried, my favourite is their Gulai Tunjang i.e. 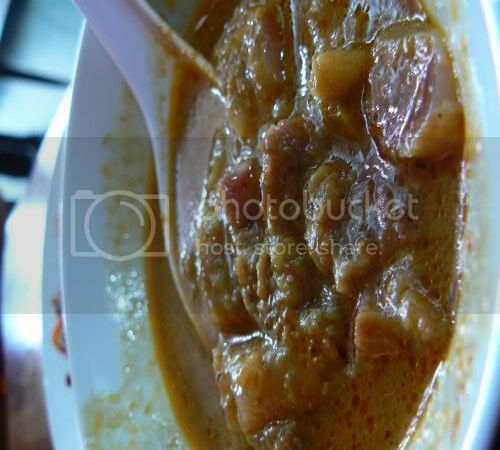 Beef Tendons in Curry. The tendons melt in your mouth while the curry is lovely and thick which went so well with my plate of rice. 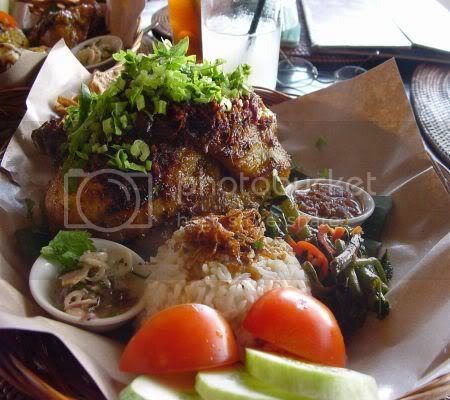 A specialty of theirs, the Ayam Kampung Goreng. Ayam Kampung is essentially free range chicken which wanders around the kampung (Malay village) that is deep fried and served with a floss which I think is shredded coconut that is full of flavours. You must eat the chicken with the floss to get the oomph of the dish or else the taste of the chicken falls flat. 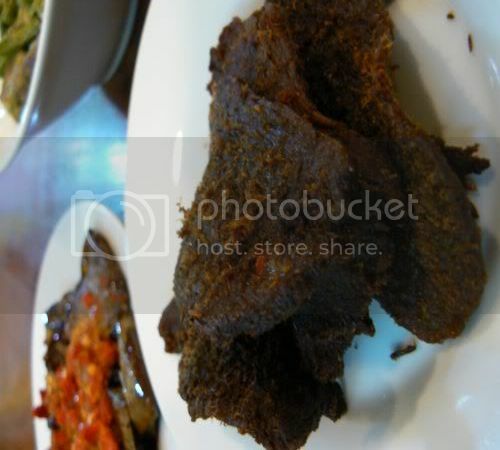 Something which is essential in all Nasi Padang restaurants, Dendeng that is crispy sliced beef that tastes a bit like beef jerky with spices. I've eaten a few versions and this wasn't my favourite as I felt it was too dry and hard. 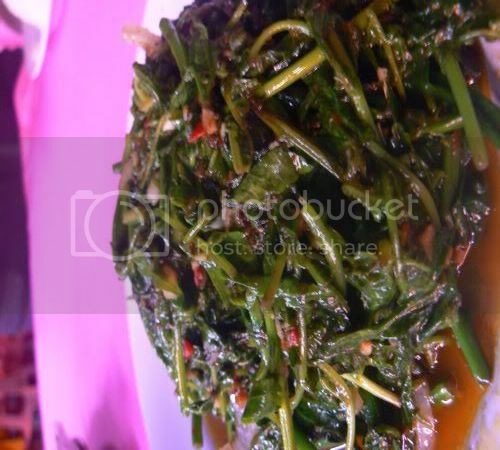 At the back of the Dendeng are the two vegetable dishes i.e. the sambal terung or eggplants with sambal which I really like. Another one is the long beans cooked in curry which was also very good. We both love this, in fact this is Splashie Boy's favourite i.e. 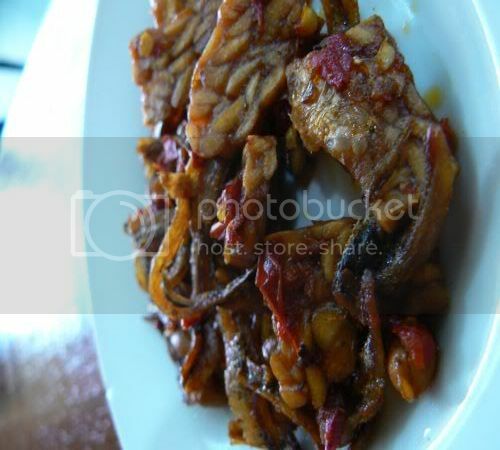 fried tempe with peanuts and ikan bilis (anchovies). You can also eat this as a snack and it's extremely addictive. 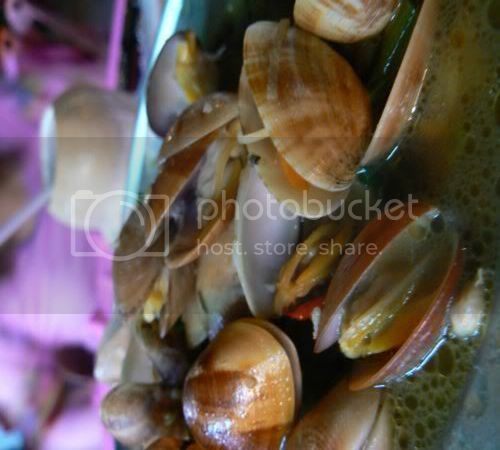 They also serve Pucuk Paku Lemak i.e. fern shoots with curry. It was not too bad and was quite spicy with green chillies. 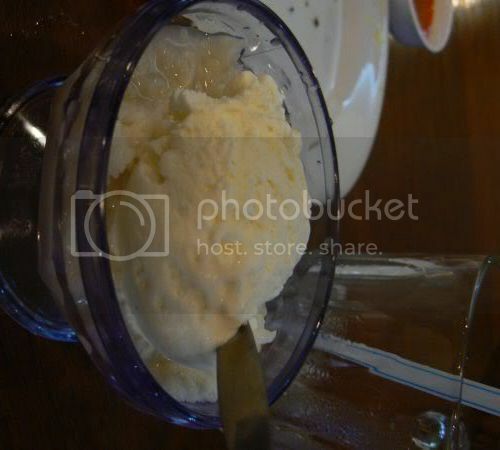 Finish off your meal with tapai and ice cream. Tapai is basically fermented rice and surprisingly cold vanilla ice cream really goes very well with it. I've always loved this combination ever since I ate it at a hotel Malay wedding and it tastes so great with strawberry sauce too. If you don't like the fermented alcohol taste, you may however find this too strong for your tastebuds. Both restaurants are furnished with restored antique furniture which adds a nice homey feel to the place. The furniture was sourced from local kampungs (Malay villages) and restored back to their original glory. You can also buy the items from the owners' furniture business that is next door to their Amcorp Mall outlet. Incidentally the restaurant has been featured in Jalan Jalan Cari Makan, the local televison food programme that goes around Malaysia looking for good food. Every time I walk past Uncle Lim's at Ikano Power Centre, it's always packed. Since we both hate to wait around for our food, we tend to avoid it. I finally had the opportunity to try out their food last weekend when I spied an outlet at Subang Parade. Incidentally, Subang Parade has gone through a tremendous facelift; everything looks sparkly white and freshly painted now plus there's a Cold Storage supermarket. Unlike the Ikano Power Centre outlet, the Subang Parade branch is much bigger so it was a breeze to get an ideal spot to take pictures. I ordered their Laksa (RM7.90+), which I have heard about. It's essentially Johor Laksa with spaghetti and thickish curry sauce laden with mackerel pieces. Initially, the laksa was pretty tasty but it got too rich after a while hence I had trouble finishing it. Splashie Boy had their Chicken Porridge (RM7.90+) which was good and laden with chunks of chicken. The porridge texture was thick and I liked the crunchy topping of fried mung bean noodles and yau char kuai (Chinese crullers). 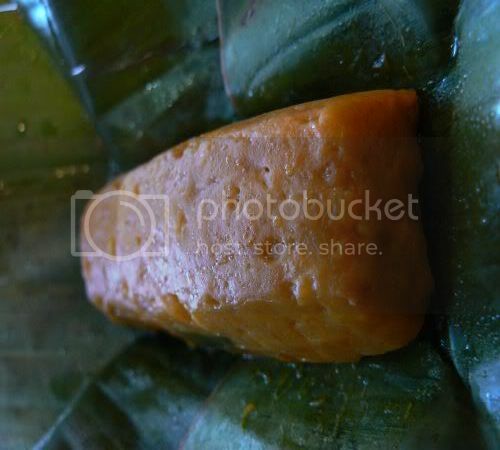 We also had the steamed otak otak(RM3.50+) which came wrapped in banana leaves. I wasn't blown away by this and thought it was slightly overpriced considering the size of it. I tend to prefer my otak otak chunkier hence this version wasn't my favourite. For drinks, I had their Cham Ice (RM2.80+) (mixed tea, coffee and milk) which I really liked while Splashie Boy settled for Cincau (RM2.50+) since he hates coffee. Coincidentally, I had dinner with a friend last night who also recently ate at Uncle Lim's. They just started (i.e. this week) to serve Prawn Mee that is slated for a limited time. She tried it out on Tuesday at the Ikano outlet and said it was horrible. The soup broth lacks taste and they served it with sotong/prawn balls that were not cooked properly. Not sure if it was a mere hiccup to their system but if that's the case, they had better rectify it or else it will definitely be a huge flop. I often scour the local papers for food write ups and if they're interesting, I'll try and make it a point to visit them. Read about this place from the Star and decided to make a visit there since it was extremely unusual to hear about cafe type of food in Shah Alam especially from Le Cordon Bleu trained chefs. Sadly I can't seem to find the original article despite whatever keywords I throw towards Google. The place is tucked within the commercial and factory area of Glenmarie so if you're not a regular around the place, you'll definitely not see it from the road. Since we went during the weekend, I have no idea what kind of clientele they have but I can imagine a niche here since the area has virtually no restaurants or this kind of cafe style food. The menu at this place is simple and very Austalian cafe as the owners studied at the Le Cordon Bleu Sydney branch plus the chef trained with Matt Moran, the famous bald headed chef from Australia. If you're an ardent Discovery Travel and Living viewer, you may have seen him as one of the judges on My Restaurant Rules. We tried out their drinks - I had their Honey Lemonade(RM5.80) while Splashie Boy had their Summer Breeze (RM6.80). 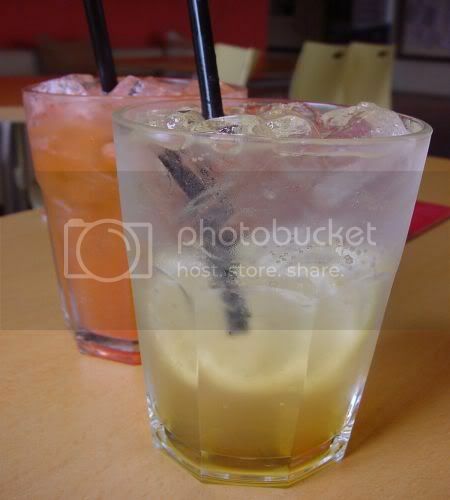 My Honey Lemonade was a change from my usual Citron Presse while Splashie Boy loved his Summer Breeze. I can't really remember what was the combination they added but it tasted really good and refreshing especially with the hot afternoon sun. The restaurant makes their own pastas so everything is nice and fresh. The menu is not extremely extensive in terms of main meals (only their lamb shank dish) with a focus more of pastas, salads and breakfast items. 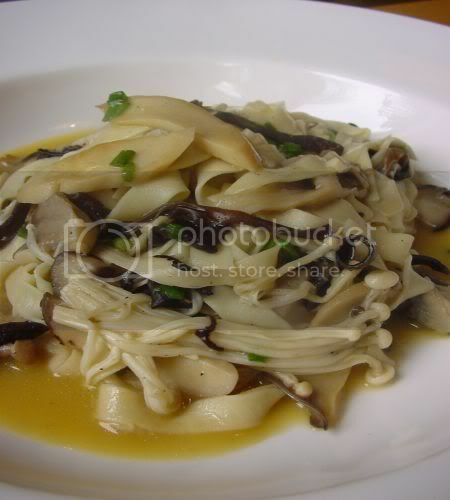 I tried out their Mushroom Medley Fettuccine (RM14.80) which was really good. Extremely light and so tasty with enoki mushrooms, button mushrooms, fresh shitake mushrooms and wood ears fungus for a crunch. If you know Splashie Boy's tastes, he loves meatballs so whenever he spies it on the menu, it's a must order. This was the creamy tomato meatball pasta (RM15.80) he had. Very nice and I love the sauce as it had no sour overtones like some places. 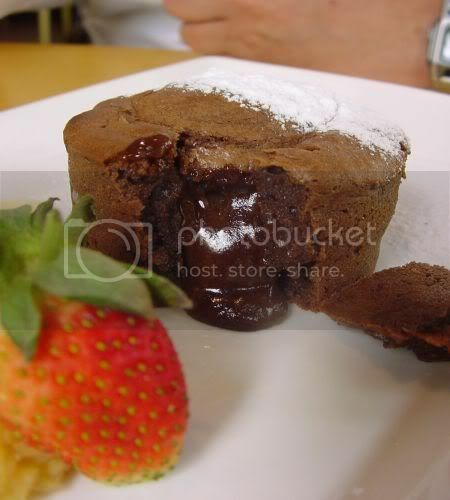 I read about their Ultimate Chocolate Fondant (RM12.80) so I had to try it out. Incidentally this part is dedicated to Fatboybakes who was trying to recreate this. No need to recreate, just come here and try theirs as it's really nice. They serve it with pineapple jam on the side and a scoop of vanilla ice cream. 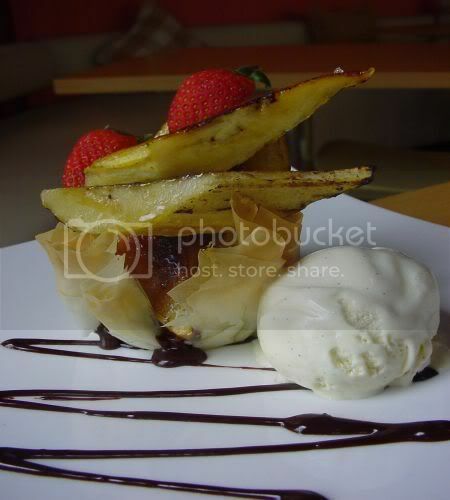 We also had their Caramelised Banana Tart (RM10.20) that came in a filo pastry shell. Pretty impressive and it was good too although we both preferred the Chocolate Fondant over it. Personally I love this place but sadly I don't go that often probably because it's quite far from my place but hey, if you live or work around this area, try it out as the food is really good. We were both joking that it must be easy for them to stock up their frozen food especially those lamb shanks since they're right next door to Pok Brothers, one of the leading food distributors in town. Hey, it's great that food bloggers seem to be getting recognition by our local press! Congratulations to all of you. I just came across today's Malay Mail article which mentioned Swee San's World Cup muffins. She's totally surprised as I just informed her. I'm sure if they had put a picture up on her muffins, those guys will be distracted from the ball to those yummy-licious jammy morsels. On Malay Mail too, a little bird mentioned to me that the cute couple over at KampungboyCitygal will be featured in an article by them. No idea when that is coming out but I'm sure both of them will scan an article for all of us. One more mention, although Robyn and Dave from Eating Asia aren't technically Malaysians but hey, they feel like one of us since they eat with as much gusto as we do plus they seem to know more good places to eat compared to the locals. They had a great mention in this month's Klue magazine together with those great pictures Dave takes. Any more guys and gals? So far those are the ones I have seen or know of, so if you do know of any more, let me know. Tis' the season for lychees hence I have been thinking of ways to use them. Decided to go savoury with them versus a sweet confection and they taste divine with roast duck slices. I'm currently reading through Thai Food by David Thompson, that bright pink encyclopedia on all things related to Thai food and culture. It's not mine but courtesy of a very sweet friend who has lent it to me. 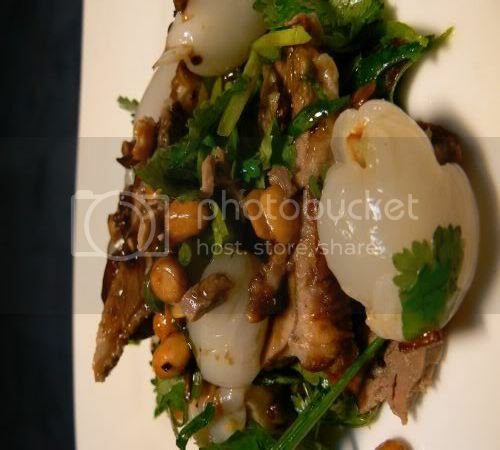 I love the salad recipes which look easy to recreate hence I picked their roast duck and lychee salad since it combined two favourite ingredients. Everything was easily assembled except the sesame seeds which were missing from my cupboards. Do give the salad a try as it was really nice. The dressing can be slightly salty so go easy on pouring it over your salad. The roast duck can be easily obtained from any of your favourite roast duck shop. Mine was packed from Restaurant Loong Foong, my favourite place for this dish especially at night. Make dressing by mixing the ingredients in. Make sure you taste it as it should taste salty, sweet and just a little sour. Adjust the ingredients added if you feel it's not the right taste. Combine all remaining ingredients except sesame seeds. Dress the salad (making sure you don't drench it but anoint the ingredients), sprinkle with sesame seeds and enjoy. Aiks! I took too few pictures of the kitties today that when I came home to check I had to reject them as those felines moved when I snapped them. Tried to take the home kitties but they don't look great under the flash so I had to dig through my archive. Found one picture of the mother and daughter - not a very clear one of the mummy but I guess it will have to do for this weekend. These two always crack me up when I see them as they look so alike. Fluffy is still extremely attached to her mother and tries to still suckle her whenever she can. Think it's just her way of getting close to her mother as the mummy cat definitely has no milk since we had her spayed. Do visit the other kitties and Kiri who is off on an adventure at eat stuff. Usually I avoid Nasi Campur restaurants as somehow the food does not taste fresh but I was blown away by this place located at Sunway Mentari. It's packed to the brim during lunchtime with people queuing up to take food from a buffet side board of approximately fifteen feet long. 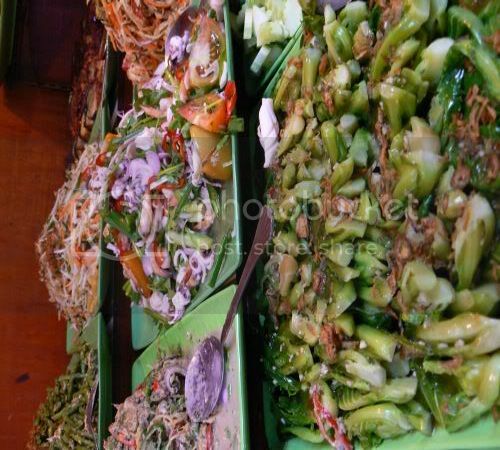 You start with the large variety of ulams, kerabus and vegetable dishes. Due to the wide length of the table plus the large crowd hanging in front of it, it's really impossible to take pictures but I managed to sneak in two - this one which shows the vegetable selection. After the vegetables you have the lauks with their curry sauces (a favourite seems to be the siput sedut lemak) and the all time favourite is the beef slices fried in ginger and spring onion. 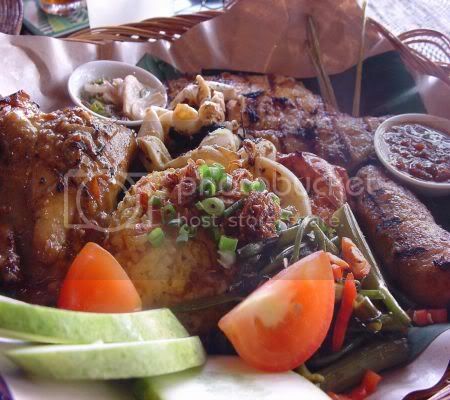 Next is the grilled fish (ikan bakar), fried chicken and fish with a whole array of sauces finishing off the table. My personal favourites were their mango kerabu, a kerabu seafood with lots of chilli padi (Malay for bird eye chilli), their beef and the grilled catfish (ikan keli in Malay) which was done percik style. You select whatever food you wish to eat with your plate of rice and find a place to sit. A person will come to look through the food you took and write the price down on a tiny scrap of paper together with your drink order. Once you're finish, just pay at the counter. 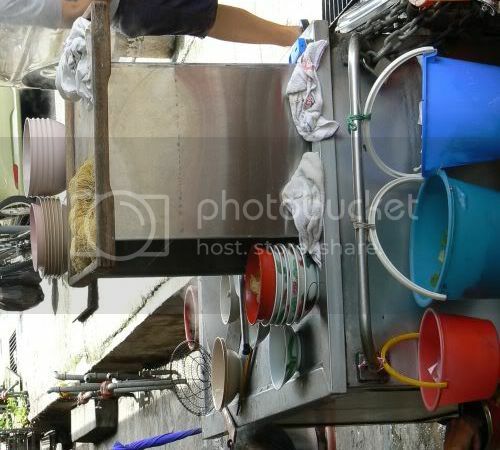 Besides their wide array of Nasi Campur dishes, they also have sup daging boiling in a huge pot at the front of the shop. You can order a bowl to accompany your meal or have it with noodles. They also serve chicken rice which looks good as you can see the rotisserie of chickens turning from the kitchen. You also get a good selection of desserts and teatime snacks in the front area which is also buffet style. Help yourself to creme caramel, doughnuts, cucur udang to complete your meal or to eat for teatime. Something I love which I don't get often, their pengat pisang (sweet banana in milk and sago pearls). There's a small selection of pengats too and the popular one seems to be the pengat jagung (corn). If you're within the area, try this place as the food is really good. The only problem with this restaurant is they are only open during the weekdays. Business is so good that they can take off during the weekends. Last night a group of us decided to have dinner at this seafood place which was chosen because a friend of ours was working around the area. My first time eating here and the food is not too bad. Even though it was a non weekend night, the place was quite packed with diners. To start off, we had their signature Siong Tong Lala (Lala in Superior Stock) which was pretty good especially the soupy bits that came flavoured with ginger shreds, chillies and rice wine. 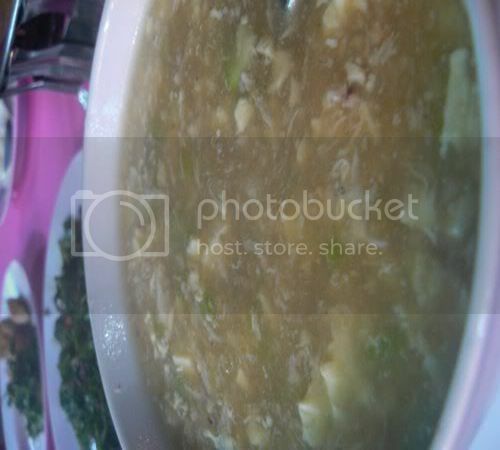 We were recommended their Tau Foo Kang i.e a thick soup which has tau foo cubes, sea cucumber, crab meat and prawns in it to resemble the shark fins soup. Although there was not much seafood in it, it was pretty good and we all finished the soup. When I heard they served paku leaves (fern tops in Malay), I chose them for our vegetable dish to be fried with sambal belachan. This was very dissapointing - they didn't pick out the hard woody bits from the vegetables and you can't really taste the sambal belachan in the vegetables at all. 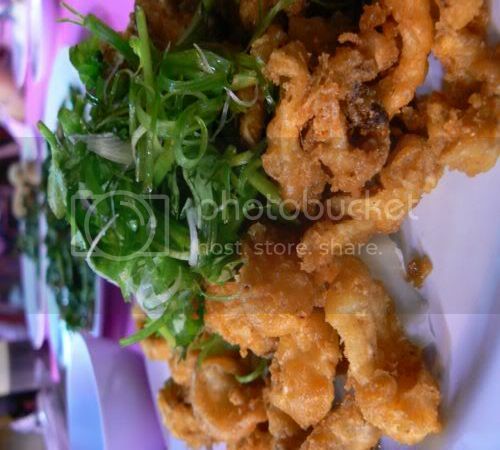 We had the fried sotong (calamari) which was pretty good as they were no rubbery bits which I warned them not to serve us any. It's still not up to Muhibbah standards but I thought it was not too bad. Finally came the dishes we were all waiting for - the salted egg yolk crabs. This was fried with lots of salted egg yolks that coated the outside of the crabs. There were also small cubes of the salted egg yolks with lots of chilli padis. We were really enjoyed our crabs that we decided to order another dish of crabs. 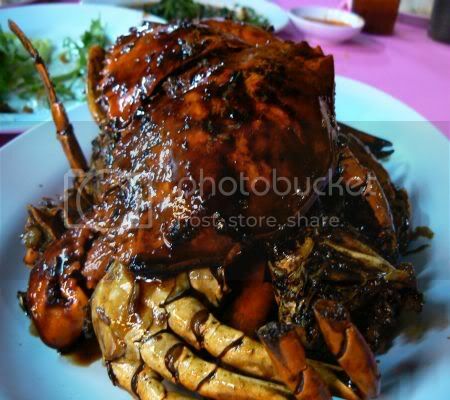 On my friend's recommendation, we had their Marmite crabs which came in a lovely sticky sauce coating the crabs. This was yummy and we all polished them off leaving only one crab piece for my friend to bring back to her dog for his present for the day (It was the dog's birthday yesterday). Pricewise, I didn't take the bill back as my friends had spent me dinner (thanks so much!) 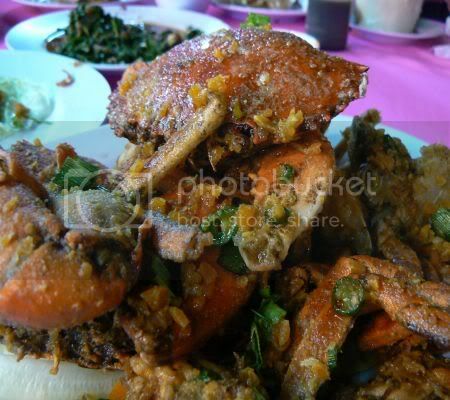 but my friend did remark that the crabs were a tad bit expensive as they had charged us RM40 per kilogram. It was lots of fun and we stayed for a long time slowly eating the crab (the best way to savour them) while catching up with each other as the last time we met was quite some time ago.